It’s an old video which has been in circulation on the internet for some time, claimed the Andaman & Nicobar Administration soon after UKs Guardian and Observer flashed three video clippings on exploitation of the Jarawa tribe, sending a message across India that ‘All is not well’ with the Jarawa tribes of Andaman. The British weekly claimed that the endangered Jarawa tribe of Andaman Islands were being exploited not just by the local tour operators but also by the A&N Administration’s men entrusted to protect the tribe members. Soon after the story flashed for the first time on 7th Jan. 2012, Indian Television Channels took up the issue and questioned the credibility of the so called ‘protectors’ of the Jarawa tribe. It is a ten year old video, claimed the Andaman & Nicobar Police. We would sue the media in the court of law for violating the law of the land, as it telecasted videos of the vulnerable tribes, Police communicated. "The Jarawa reserve belt is a highly sensitive zone. The government policy is of zero contact and action needs to be taken against the lawbreakers." "We are going to take action against the person who shot the video," said the Chief of the Andaman & Nicobar Administration, Shakti Sinha in reply to the questions raised by media. “We would also cancel the licence of the tour operators who are involved”, he stated, not being aware that the A&N Administration does not have any policy in place to provide licences to tour operators at the first place. Not able to get to the culprits inspite of clear evidences pouring in from different sources, A&N Police finally arrested two persons who had claimed before the British Journalist that Human Safari is possible, by bribing policemen posted in the Jarawa reserve forest. The names of the two, one an owner of a handicraft shop and the other a cab driver was mentioned in the story carried by the Observer. Both the driver and the shop owner were remanded to judicial custody and charged under sections 292/34 IPC rws 67 IT Act, section 3(1) (iii) & (x) of SC & ST (POA), 1989 and section 7/8 PAT Regulation, 1956, for their statement and for the human safari which they claimed but did not do. The cab driver by charging for a ‘regular official safari’ amount had taken the journalist upto Middle Strait through the Andaman Trunk Road, as being done by ‘ANIIDCO’, a corporation owned by the Andaman & Nicobar Administration itself. “Tour to Baratang by ANIIDCO. Daily trips to Baratang except Monday. Rate per person A/C bus: Rs. 1000/-, Non - A/C bus: Rs. 850/- …” is a regular announcement appearing in the Administration’s mouthpiece “The Daily Telegrams”. Taking the story further, the British weekly ‘Observer’ on 5th Feb. 2012 flashed two more video clippings exposing the concerned govt. authorities as a part and parcel of ‘Human Safari’. Unfortunately this came as a shocker to a few who tried their best to prove that the A&N Administration and the police need to be given a clean chit for their efforts to protect the endangered tribe. “This is a good enough evidence and we will be taking action against the culprits”, the Chief Secretary, Shakti Sinha reacted. Three days after the second video surfaced, the A&N Police identifies a Police Constable who was encouraging an ‘unknown’ videographer to shoot ‘semi naked’ Jarawa girls (in their traditional attire) while dancing in return for food. “He has been placed under suspension for dereliction in discharge of his duties and a departmental enquiry has been initiated against him”, the A&N Police announced. We are putting in vigorous efforts to identify the other person who was video filming the protected tribe”, it added. On 20th Feb. 2012, the A&N Police finally arrested another Policeman who shot the clipping, which is a good sign indeed. The A&N Police has also claimed to investigate further and trace out the men in camouflage, who were visible in the video clip. The actions and reactions of the Andaman & Nicobar Administration and the police during the past one month had cleared one fact if not all, that they were either unaware of the ground realities or have pretended to be so. Reasons??? The Andaman Trunk Road, which cuts through the Jarawa’s forest, brings poachers, settlers and tourists into the heart of their land. The Supreme Court of Indian in 2002 ordered that the road must be closed, but it has never been complied with. It was an easy way to make money for the many ‘unaware’ tour operators but the A&N Administration sat over it pretending to be unaware. When reported by NGOs and media, the Administration often came out with a notice which read “Warning to Tour Operators” and the Safaris, exploitations… continued. The NGOs and local media on many occasions tried their best to bring to the notice of the A&N Administration that Jarawa tribes are being exploited by tour operators and also by the govt. officials (men in uniform) either when posted to protect the tribe or while travelling on the ATR as ‘official guests’. In the month of June 2011, ‘Search’, a local organisation along with ‘Survival International’ had agreed for a joint campaign to tell the tourists to boycott Andaman Trunk Road, as it was illegal. The Supreme Court of India in 2002 had ordered that the road should be closed after considering the ill effects it had on the members of the Jarawa tribe. The Supreme Court Order on May 7th 2002 was a result of a PIL (Public Interest Litigation) moved by NGOs SANE, Kalpavriksh and BNHS. The Court ordered the closure of the Andaman Trunk Road, among the other things including removal of forest encroachments, within a period of 90 days from the date of the order. ‘The Andaman Trunk Road should be closed to all vehicular traffic from Miletilak in South Andaman to the northern boundary of the S. Andaman Island… (and) from Kadamtala in Middle Andaman up to Kaushalya Nagar. It had come as a surprise then, when the A&N Administration had acted very bizarrely on the order of the Apex Court of India. The Administration immediately targeted on removing forest encroachments, in a most inhumane manner to create a panic in the islands but preferred not to obey the ruling to close down the Andaman Trunk Road. The Joint campaign by the two organisations Search and Survival International in June 2011 apart from concentrating on the tourists also aimed to make the tour operators aware of the need to protect the endangered Jarawa tribe. As a result leading travel companies in Andaman and many more tour operators agreed and accepted voluntarily to be a part of the campaign. The campaign came as a trouble for the same A&N Administration, who had consciously preferred not to close down the Andaman Trunk Road even after almost a decade. As the campaign gained momentum, the A&N Administration tried to play the same old game, as done in 2002 to create a panic among the islanders. On 28th Sept. 2011 the Administration decides to reduce the convoy on the Andaman Trunk Road, explaining it to be the ‘Order of the Supreme Court’. “In pursuance of the directions 'Hon’ble Supreme Court of India for minimizing vehicular traffic on ATR, the Andaman & Nicobar Administration has decided that the timings of the convoys operating on Andaman Trunk Road (NH-223) between Jirkatang and Middle Strait and back shall be modified and new convoy timings shall be made effective from 28th of September 2011”, an Administration’s release stated. All restrictions, like ‘permit to travel on ATR’, ‘no same day return on ATR’ etc. were lifted sending an indirect message across that the illegal Andaman Trunk Road is now legal. But as the convoy reduced, panic and uproar loomed large over the islands. There were long queues of vehicles 70-80 at a time that waited at the entrance of the first check post ‘Jirkatang’ for their chance to travel on the ATR. The time of travel on the road too was doubled. Political parties started organising meetings and demanded that the road ‘a lifeline’ of the islanders should not be closed. They even threatened for a mass protest if there is any move to close down the lifeline of the islanders. There were also suggestions to increase the convoy so that it continues till late in the evening. To pacify the islanders, even the Lt. Governor of the Islands (although a representative of the President of India) had held series of public meetings across North and Middle Andaman district along with the State President of Congress party. He daringly claimed before the public that the ATR will not be closed. “… some unscrupulous people are behind the act who want to close our ATR and create rift between tribal and non-tribal people. However, we all know that our islands are example of unity in diversity before the world. The Administration is trying that the ATR road is not closed and the cordial relationship between tribal and non-tribals are maintained”. Ten years after the Supreme Court of India ordered to close down the Andaman Trunk Road, the A&N Administration has been sitting over it. It has been made clear by the statements of the Administration that it refers to the Supreme Court’s judgment, only when it wants to impose things and create panic in the islands. In 2007, the A&N Administration in the name of protecting the Jarawa had come up with a notification to create a Buffer Zone (a no man’s land) which starts from the Jarawa reserve boundary. The notificThe Supreme Court Order on May 7ation specifies that the Buffer Zone will be 5 Kilometres from the Jarawa Reserve extending into the settlement area and 10 Kilometres from the high tide level into the sea. No commercial activities will be allowed inside the Buffer Zone including shops, restaurants, lodges, hotels etc. the notification mentions. As a result in 2010 many of these small establishments and resorts falling into the Zone were closed down. Food licences needed to run even ‘tea stalls’ were cancelled by the Health Department. Development activities of nearly 40 settlement villages came to a standstill because of this notification, all in the name of protecting the Jarawa. The situation became panicky, which was followed by street corner meetings, public meetings, road blockages and protests by the villagers. A case was filed against the notification and the matter is pending before the Supreme Court of India. The Director of Tribal Welfare, A&N Administration Mr. S.A. Awaradi in 1990 had come up with a Master Plan 1991-2021 for the welfare of the primitive tribes of A&N Islands. In this master plan, Awaradi had recommended for a Buffer Zone but not a 5 Kilometres zone to create unrest among the settlers. “The actual Buffer Zone is about 8 meters wide belt along the demarcating line and the latter is drawn interior in the forest nearly 500 meters away from the existing revenue boundary/ the Andaman Trunk Road/ the forest management region. Thus there is a 500 meters wide safe zone between human activity areas of non autochthons on one side of the Buffer Zone and that of autochthons (Jarawa) on the other”, was the recommendation of Awaradi in his master plan. Modifying the recommendation of the Master Plan, the Lt. Governor of A&N Islands who is also the Administrator issued a notification of a 5 Kilometres Buffer Zone, explaining that it is needed in the interest of the Jarawa tribe. Such a notification was never recommended even by a Sub Group of Experts on Jarawa constituted by the National Advisory Committee headed by Mrs. Sonia Gandhi. The National Advisory Committee had in fact instructed the Andaman & Nicobar Administration to find an alternate sea route by-passing the Jarawa reserve area. The Andaman & Nicobar Administration ‘adamant’ not to obey the Supreme Court’s Order has been trying out these tricks to create a rage among the islanders and make them raise voice against closing of the Andaman Trunk Road and for ‘mainstreaming’ the Jarawa tribe. Is the Andaman Trunk Road really a ‘lifeline’ of the islanders? Years after the Andaman Trunk Road was declared open for vehicles, the Directorate of Shipping Services, A&N Administration had continued to ply ferry boats from Port Blair (Islands’ capital) to Baratang in the Middle Andaman. This trip was gradually faced out, thereby making the settlers dependent on the ATR. Moreover explaining that the road is needed to reach food materials and other essential commodities to the settlers of North & Middle Andaman, the local Administration had even allotted separate convoys for ‘Goods Carrier’ vehicles. In 2006 the Andaman & Nicobar Administration created the third district called Mayabunder District that covered Middle & North Andaman. This was done with an intention of developing the area and making it self-dependent. The villages under the new district had remained underdeveloped even after more than 50 years of settlement. A separate Zilla Parishad (elected body) was also declared for the new district. But in the name of development, six years down the line, a number of new concrete structures were constructed. “The situation has gone worse after the new district was created. We used to have regular mainland bound passenger ships berthing at Mayabunder but it has been stopped. There are no regular ferry services to connect the district to Port Blair city”, said Mr. Siddique, an elected representative in the new district. “Some private cargo vessels are berthing at Mayabunder to offload cargo. This is done to avoid paying Octroi to the Port Blair Municipal Council if the vessels are berthed at Port Blair”, he said. “We can be self-sufficient and develop at par with South Andaman if the A&N Administration really intends to help”, Siddique adds. When asked about ATR, Siddique said it should not be closed. “It is a great help in times of emergency”. But when asked, if the new district has regular passenger ships, inter-island boats, cargo vessels and the newly introduced Sea Plane service and Helicopter Service to airlift ailing patients, would the ATR still remain a lifeline, the elected representative preferred not to comment. Similar are the reactions of the residents of North & Middle Andaman for whom the Andaman Trunk Road has become a lifeline in the absence of alternate connectivity and holistic development of the new district. The Andaman & Nicobar Islands being a protected area in terms of its fragile ecology and indigenous tribes is not able to produce food grains to suffice the ever increasing settler population, which has reached around 600,000. The islands settlers completely depend on imports from mainland India. The goods are brought to Port Blair city in the South Andaman and then transported through the Andaman Trunk Road to cater to the needs of the settler population in the North & Middle Andaman. The concept of ‘ATR as Lifeline’ can thus be done away with if the intentions of Andaman & Nicobar Administration are clear. What do the Jarawa want? 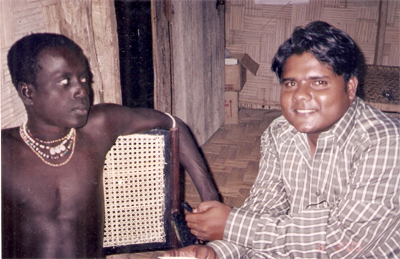 ‘En-mei’ is the first Jarawa man to be treated with modern medicines. After he returned back to the forest, he explained to his people that the outsiders did not hurt him. Instead they were nice to him. This incident was one reason that bridged the gap between the islanders and the settlers. The tribe thus gave up hostility and accepted whatever the outside world had to offer. In 2003, when I interviewed En-mei at the Primary Health Centre at Kadamtala, where he used to regularly visit, the Jarawa man described his world at length. He spoke about his friends, elders, rituals his wife Chaila and also about the world outside his forests. When asked about his forest home, En-mei explained that his elders had told him that the jungle is good. The outsiders used to attack us… scared us using guns. They killed deer and set traps in the forest. If one clears forest, we won’t get rains, the Jarawa man explained. Anger isn’t good. I don’t get angry. The vehicle, bus, jeep are good he says yet my jungle is good and I don’t feel like going outside. “I was very scared. My Mother did not come. Father also did not come”. The medical is good he says. “When I returned, I told everyone that the outsiders are good. No one attacked me. I told this. Outsiders are good”. When asked whether he was annoyed when outsiders abused his tribe En-mei says, “No, I am not annoyed. We laugh… but we are never angry”. When asked about the outside world and the facilities it had, he answers “Jungle is good”. Not wanting to offend the outsiders, the Jarawa man says, “Outside is good… Jungle is good”. Pointing out at the Jarawa boy standing next to him, En-mei explains that they stay at Port Blair for some time and then the come back to Kadamtala by bus. They start realising its good in the jungle. He says it will be good if the outsiders leave the jungle and go. “When we see new faces we don’t feel good. When we see them on certain occasions it’s good”. The poachers come in large numbers and cut down trees. It’s not good, he explains. When asked whether he knew about money, En-mei says “Yes I know. We give it to the shopkeepers. He gives us to eat”. Finally when asked about the youngsters who are seen begging on the road, En-mei explains “It is bad and that is why I don’t go to the road”. “I tell the children not to go to the road. When we are there we tell them and they go back to the forest”.